Auckland Tours - full day - to experience all the best of the beautiful “city of sails”. 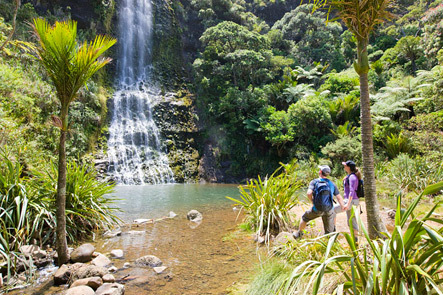 Our highly-acclaimed Auckland Tours include spectacular ocean vistas, dramatic views from the top of several volcanoes (Auckland is built on an amazing volcanic field), lush green parkland, iconic landmarks, tranquil harbourside bays, untamed coastline, ancient native rainforest and unique indigenous flora and fauna. On our Auckland Tours you will see why Auckland is known as one of the world’s most beautiful cities and regions in the world! Includes pickup and return to the central city. Our tours are very personal and include all the sights of our Half Day Auckland Tours plus much more, including a visit to the wild West Coast of Auckland to see stormy seas, black sand beaches, native rainforest and wildlife. A day you’ll never forget! Discover why Auckland was recently named one of the best cities in the world to live. On our Auckland Tours we will show you some stunning scenery to take your breath away. Continue with a drive through the suburb of Parnell, restored in the old colonial style and with many beautiful mansions. From here, drive along the waterfront of Tamaki Drive to see several of the stunning beaches along Auckland's shoreline. The Harbour Bridge, spanning sparkling blue waters dotted with white sails. Devonport, the picturesque old North Shore marine village nestled in the shadow of historic Mount Victoria with great cafes and boutiques and blessed with a wonderful view back across to Auckland city. Free pick up from Auckland central, all transport, a fully guided personal Auckland Tour, snacks, hot/cold drinks and a great picnic lunch! Outdoor clothing to keep warm and dry, walking shoes, sunscreen, a sunhat and definitely your camera!